With the prevalence of homelessness and overpopulation across the country, Rinker Materials™ and the American Institute of Architecture Students (AIAS) joined forces to make affordable, high-quality housing a reality through the vision of architectural student Sandra D. Guillen. A native of La Paz, Bolivia and the single mother of a 12-year-old son, Guillen tapped personal experiences to win the Rinker Materials/AIAS Pipe Dream tiny home design contest. Based on her design, the first tiny home built from concrete pipe in the U.S. will be revealed at the International Builders’ Show (IBS) in Las Vegas on February 19th. Challenged to transform concrete pipe traditionally used for underground stormwater management from Rinker Materials into a tiny home, Guillen bested other AIAS members by focusing on function and comfort. She also leaned on her dream of becoming an architect to reconstruct the 8-foot diameter, 16-foot long concrete pipe into a mobile, stackable, durable, sustainable and relatively inexpensive alternative to traditional housing. The next generation of tiny homes, concrete pipe is a real-world solution for homelessness and overpopulation as well as those displaced by natural disaster or simply unable to afford a home. Extending the natural cool gray of the concrete pipe, Guillen integrated light blues and off whites into the home design. She chose these popular neutral colors to give the home a soft and welcome feel, while making the nearly 100 square-foot domicile seem much larger. The effect of enlarging the tiny home was also accomplished by incorporating tile surfaces, large French glass front doors and two retractable glass windows in the rear. A covered porch and large paver patio with grill significantly increase the living space outside of the tiny home as well. To streamline the process, Rinker Materials turned to fellow QUIKRETE® companies, Custom® Building Products and Keystone Hardscapes®, for the tile and paver installation, respectively. The wooden-frame, four-section modular tiny home design – kitchen, a bathroom, living area and combination bedroom/office – can be assembled in a Rinker Materials concrete pipe in less than a day (excluding electricity and plumbing). The 30 ton fire-resistant concrete pipe can be easily transported on a flatbed truck and simply requires eight commercial-grade rubber wheel chocks to stabilize the tiny home. While amenities will dictate the final cost of a tiny home built from concrete pipe, the prototype revealed at IBS was about $35,000. The core cost for the concrete pipe is about $14,000, so the overall tiny home could be more or less expensive depending on how it’s customized. Sandra’s original submission can also be found on Instagram, in addition to the second place winner, Andrew Smith from Kennesaw State University, and Jenny Nguyen, the third place winner from the University of Arizona. 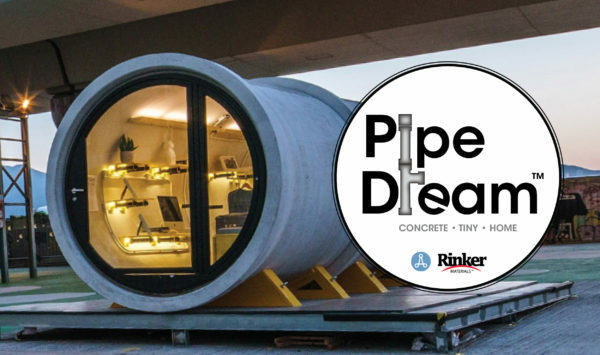 For more details on the Pipe Dream project including photos and videos highlighting Guillen’s story, design concepts, construction and the future of tiny homes made of Rinker Materials concrete pipe, visit www.RinkerPipeDream.com. The American Institute of Architecture Students (AIAS) is a non-profit, student-run organization dedicated to programs, information and resources on issues critical to architecture and the experience of education. For more information, visit aias.org or call Kimberly Tuttle at (202) 808-0036. Rinker Materials™, a QUIKRETE® Company, is one of the nation’s largest and leading manufacturers of concrete pipe and related products for the collection, treatment, safe storage and/or controlled release of stormwater. Founded in 1963 and headquartered in Houston, Rinker Materials™ produces a full range of concrete piping and precast concrete box culverts from more than 30 U.S. facilities. Rinker Materials™ products meet or contribute to pipe specifications defined by American Society of Testing Materials, American Association of State Highway & Transportation Officials, American Railway Engineering and Maintenance-of-Way Association, American Society of Civil Engineers, American Society of Testing Materials and/or United States Bureau of Reclamation. For more information, visit www.RinkerPipe.com.